The combined top federal tax rate on equity-financed corporate income in the United States is 50.47 percent, compared to a top federal tax rate of 43.4 percent on other business income. Equity-financed corporate income is subject to a higher tax rate than other business income because it is subject to a double tax: once on the corporate level, through the corporate income tax, and once on the shareholder level, though the individual income tax on dividends. Taxing equity-financed corporate income at a higher rate encourages the misallocation of investment capital. Ideally, all business income would be subject to the same top tax rate, regardless of the legal form of the business or the method of financing. Short of reforming the entire U.S. tax code, integrating the corporate and individual income taxes could eliminate the double taxation of corporate income. There are several ways to integrate the corporate and individual tax codes, including allowing shareholders a credit for corporate taxes paid (credit imputation) or allowing corporations to deduct dividends paid (dividends paid deduction). Each of these strategies for corporate integration presents different opportunities and challenges. Corporate integration would accomplish many of the same goals as a corporate rate cut, such as making the U.S. business climate more competitive. It could also end several economic distortions created by the current tax code, including the tax preference for debt financing over equity financing. According to recent reports, Congressional lawmakers are in the process of drafting a plan to integrate the individual and corporate tax codes. Because Congress has not focused on the topic of corporate integration since 2003, many Americans may not be familiar with the idea of integrating the individual and corporate tax codes or the rationale for doing so. Under the current U.S. tax code, the taxation of business income varies based on the legal form of the business and the method of financing. Most importantly, income that is earned by corporations and funded by equity (stocks) is subject to a double tax: once on the corporate level, when it is earned, and once on the shareholder level, when it is distributed as dividends. The double taxation of equity-financed corporate income leads to several major economic distortions. It encourages investors to shift their investments from corporate to non-corporate businesses, leading to a less efficient allocation of capital. Furthermore, it incentivizes corporations to fund their operations with debt, rather than equity, leading to excessive leverage. Corporate integration refers to a set of proposals to standardize the taxation of business income across legal forms and methods of financing. The chief advantage of corporate integration is that it would end the double taxation of equity-financed corporate income without eliminating the corporate income tax altogether. It is a testament to the glacial pace of tax policy change in the United States that Congress has not yet enacted corporate integration. Since 1975, there have been no fewer than twelve major corporate integration proposals from members of both parties in the legislative and executive branches. However, none of these proposals have been passed. Now that corporate integration is back on Congress’s agenda, this paper makes the case for why corporate integration is an important component of tax reform. It also outlines two ways to integrate the individual and corporate tax codes and discusses the opportunities and challenges presented by each. It could invest in a partnership. It could invest in a corporate bond. It could invest in corporate stock. Notes: The tax rates shown above are marginal rates and apply to a marginal business investment. When a corporation earns income that is financed by debt, it is required to report the income under the corporate income tax. However, the corporation is also able to deduct its interest payments on its debt. This means that, on the margin, debt-financed corporate income is effectively excluded from the corporate income tax. However, this income is subject to the individual income tax, once it is distributed to debt-holders in the form of interest. Individuals that hold corporate debt are taxed on the interest income at a top rate of 43.4 percent (the top bracket of 39.6 percent, plus the 3.8 percent net investment income tax). When a corporation earns income that is financed by equity, it is not allowed to deduct its dividend payments to shareholders, and the income is taxed at a top rate of 35 percent under the corporate income tax. The income is then subject to a second layer of taxes when it is distributed to shareholders as dividends, which are taxed at a top rate of 23.8 percent under the individual income tax. When taking both corporate and individual income taxes into account, equity-financed corporate income is subject to a top tax rate of 50.47 percent. As these examples show, the U.S. tax code treats corporations differently than other forms of business. Specifically, corporate income is subject to two levels of taxation: once at the entity level, through the corporate income tax, and once at the individual level, through the individual income tax. On the other hand, income earned by pass-through businesses, such as partnerships, is not subject to any entity-level taxes, and is only taxed through the individual income tax. In the example shown above, a corporation makes $100 in profits and pays out $100 in interest on the debt used to finance its activities. Because the corporation is able to deduct its interest payments from its income, it owes no corporate income tax. However, the individuals that receive the $100 in interest payments pay a top individual income tax rate of 43.4 percent, leaving them with $56.60 in after-tax income. While the corporation in this example also makes $100 in profits, it is subject to a different tax burden because of its method of financing. Unlike interest payments, dividends that corporations pay to shareholders are not deductible. As a result, the corporation’s profits are first subject to the 35 percent corporate income tax rate, leaving it with $65.00 in after-tax income to distribute as dividends to its shareholders. These dividends are then taxed under the individual income tax at a rate of 23.8 percent, leaving the shareholders with $49.53 in after-tax income. While these examples are simplified, there is also clear evidence that equity-financed corporate income is subject to a uniquely high tax burden under the current U.S. tax code. In December 2014, the Congressional Budget Office issued a report that found that equity-financed corporate investments are subject to an average effective tax rate of 38 percent. To contrast, equity-financed pass-through business investments are subject to an average effective rate of 30 percent. In general, there is rarely a good reason for some types of economic activity to be taxed at higher rates than others. In fact, most economists agree that taxing specific segments of the economy at higher rates leads to economic inefficiency, by causing individuals to make choices based on tax considerations, rather than the economic merits. The principle of tax neutrality – that a tax system should neither encourage nor discourage specific economic decisions – is embraced by public policy scholars throughout the political spectrum. Corporate integration – taxing all business income at the same top rate, regardless of the legal form of the business or how the income was financed – would minimize the economic distortions created by the U.S. tax code and conform to the principle of neutrality. Thus, the burden of proof rests upon those who would seek to tax certain business income at higher rates, to show why the benefits of such a policy would outweigh the accompanying economic harms. Corporate income is currently taxed twice… This “double taxation” is a much reviled but stubbornly persistent feature of our current system. Few, if any, commenters suggest that we would consciously adopt it if we were working from a blank slate, and most openly recommend double taxation’s demise. Some defenders of the double taxation of corporate income argue that it is “the fee that stockholders pay for the benefits of corporate status.” In fact, the evidence is mixed as to whether the burden of corporate taxes is primarily born by shareholders. After all, if investors respond to higher U.S. corporate taxes by shifting their investments to lower-tax countries, their investment returns will barely be harmed, while U.S workers will bear the bulk of the burden. In fact, in a survey of public finance economists, the median respondent thought that only 40 percent of the corporate income tax burden is born by investors. The lack of convincing arguments for the double taxation of corporate income, combined with the strong presumption that all business income should generally be taxed at the same rate, should be sufficient to show why corporate integration would be highly desirable. Nevertheless, it is also useful to highlight specific economic harms that result from higher taxes on equity-financed corporate income. When a corporation makes a new investment, it faces a choice between two basic ways of obtaining the necessary up-front cash: debt and equity. When a corporation finances an investment with debt, a debtholder becomes entitled to a stream of fixed payments from the corporation in the future. On the other hand, when a corporation finances an investment with equity, a shareholder becomes entitled to a share of the corporation’s future profits and usually gains the right to vote on matters of corporate policy. Investors face a complicated choice when determining how much new investment to finance with debt and how much to finance with equity. For instance, the more that a corporation relies on debt financing, the more time and money the corporation may have to waste in bankruptcy proceedings should it default. On the other hand, the more that a corporation relies on equity financing, the more conflicts may arise between managers and shareholders, who often have opposite interests. There is a large economic literature that discusses the relative merits of debt and equity financing for corporations. Economists generally assume that corporations strive for an “optimal” mix of debt and equity, one that minimizes the disadvantages of each. However, the U.S. tax code encourages corporations to deviate from the ideal mix of debt and equity. As discussed above, under the current U.S. tax code, equity-financed corporate investment is subject to a top rate of 50.47 percent, while debt-financed corporate investment is subject to a top rate of 43.4 percent. As a result, the tax code incentivizes corporations to take on higher-than-optimal levels of debt. There is reason to believe that the tax bias towards debt creates harmful macroeconomic consequences. Lower taxes on debt may lead corporations to engage in more risky behavior and increase the chance of firm bankruptcy. Furthermore, there is evidence that recessions caused by debt bubbles are more harmful than those caused by equity bubbles, making the favorable tax treatment of debt even more suspect. Economists across the political spectrum agree that the corporate tax code’s bias towards debt over equity is harmful. By standardizing business taxation across methods of financing, corporate integration would put an end to this unideal tax preference. Another harmful consequence of the double taxation of corporate income is that it encourages the misallocation of capital among business forms. The majority of businesses in the United States are not corporations. 32.8 million businesses that filed tax returns in 2012, and only 1.6 million were traditional C corporations. The other 31.2 million were pass-through businesses, such as partnerships, sole proprietorships, and S corporations. As described above, pass-through businesses do not face any entity-level taxes. Instead, their profits are passed on to individual taxpayers and taxed through the individual income tax code. On the other hand, the profits of C corporations are taxed on both the entity level and the shareholder level. 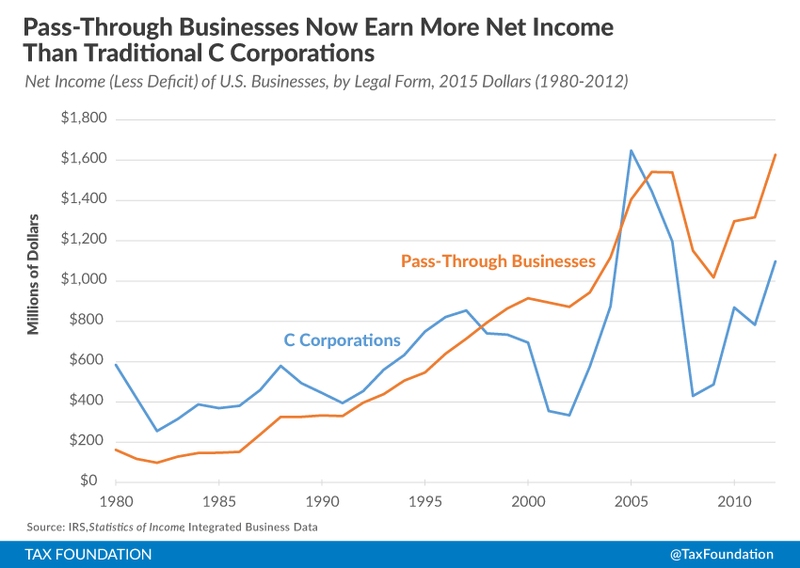 As a result, C corporations typically face higher marginal and effective tax rates than pass-through businesses. All else being equal, we would expect that these higher tax rates on C corporations will lead to underinvestment in C corporations and overinvestment in pass-through business. In other words, the current business tax code may prevent some investors from making otherwise productive investments in C corporations because of the tax consequences. Indeed, over the past thirty years, in response to the high tax burden on C corporations, more and more business activity has shifted to pass-through business. In 1980, pass-through businesses only accounted for 20 percent of total business income in the United States. By 2012, 64 percent of net business income was earned by pass-throughs. In other words, over the last 35 years, the United States has seen a large reallocation of capital from C corporations to pass-through businesses, due to the high tax burden on C corporations. To the extent that this shift was driven by tax policy, rather than economic fundamentals, the current allocation of capital in the U.S. is likely not as efficient as it could be. By equalizing tax rates on corporations and pass-through businesses, corporate integration could also lead to more efficient investment across business sectors. These proposals share several features in common. All of them would standardize the taxation of business income across legal forms and methods of financing. As a result, each would reduce or eliminate the double tax on equity-financed corporate income. However, corporate integration proposals vary significantly in design. For instance, one way of integrating the corporate and individual tax codes is simply to exclude dividends from shareholder-level taxes altogether (dividend exclusion). Another is to allocate a corporation’s income to its shareholders as it is earned (shareholder allocation). Below, I highlight two of the most straightforward methods for integrating the corporate and individual tax and describe them in detail. The first (dividends paid deduction) would shift a substantial portion of the corporate income tax to the shareholder level. The second (credit imputation) would move in the opposite direction, reducing taxes paid at the shareholder level. Perhaps the simplest way to integrate the corporate and individual tax codes would be to tax dividends received by individuals at ordinary income rates and allow corporations to deduct all of their dividends paid. The table below shows an example of how this would work. The corporation in this example earns $100 in profits and distributes all of its profits as dividends. Because the corporation is able to deduct its dividends paid, it has no taxable income and owes no corporate income tax. Meanwhile, the corporation’s shareholders are taxed on their dividends at a top rate of 43.4 percent – the same as the current top tax rate as interest income. Indeed, a dividends paid deduction would make the tax treatment of dividends almost identical to the tax treatment of interest, erasing the tax code’s bias toward debt. It would also put the tax treatment of investments in corporations on par with the tax treatment of investments in pass-through business. A dividends paid deduction would shift a large portion of the corporate income tax burden onto shareholders. As a result, the chief pitfall in designing a dividends paid deduction is that some shareholders of U.S. corporations are exempt from U.S. taxes on their dividends. To the extent that a dividend paid deduction system could leave some dividend income subject to no additional U.S. taxes, this would reduce federal revenue significantly. For instance, tax-exempt organizations in the United States are not generally required to pay taxes on the dividends they receive from corporations. Implementing a dividends paid deduction would be a windfall for these organizations: the corporate-level taxes on their investments would drop significantly, while their shareholder-level taxes would remain at zero. Similarly, foreign shareholders of U.S. corporations would see the corporate-level taxes on their investments fall, without paying any additional shareholder-level taxes to the U.S. federal government. Another relatively straight-forward strategy for corporate integration is credit imputation. Under a credit imputation system, both a corporation and its shareholders pay taxes on corporate income, but the shareholders receive a credit for all taxes paid at the corporate level. Notably, this is the method of corporate integration used in Australia and six other countries. The table below shows how a credit imputation system would work. The corporation in this example earns $100 in profits, pays $35 in corporate income taxes and distributes the remaining $65 in dividends. Shareholders pay ordinary income tax rates on their grossed-up dividends. For instance, a household in the top income bracket would pay $43.40 in taxes on dividends. Finally, shareholders receive a refundable credit for all corporate income taxes paid. As a result, a household in the top income bracket would owe only $8.40 in taxes on dividends. Credit imputation would nearly eliminate the tax code’s bias towards debt over equity, and would equalize the taxation of corporations and pass-through businesses. This is clear from the example above, where a $100 corporate equity investment faces $43.40 in combined taxes – the same as the tax burden on pass-through business and on corporate debt. It is useful to note that, under a credit imputation system, every additional dollar that a corporation pays in corporate income taxes means one fewer dollar that its shareholders pay in individual income taxes, and vice versa. For instance, if the corporation in the example above had only paid $25 in corporate income taxes instead of $35, its shareholders would have owed $18.40 in individual income taxes, instead of $8.40. Corporate integration would not fix all, or even most of the problems with the U.S. business tax system. The United States has one of the highest statutory corporate tax rates in the world, a counter-productive set of rules regarding overseas income, and a cumbersome system of depreciation and cost recovery. Corporate integration would not solve any of these issues. However, corporate integration could lead to several important incremental improvements to the current U.S. tax code. Corporate integration would lower the combined tax burden on corporate income, which would increase investment and economic growth in the United States. It would eliminate the tax code’s bias in favor of debt over equity, leading to better investment decisions. And it would put corporate investment on par with non-corporate investment, leading to a more efficient allocation of capital. Bernie Becker, “Hatch to take a shot at corporate double tax,” Politico, January 21, 2016, http://www.politico.com/tipsheets/morning-tax/2016/01/hatch-to-take-a-shot-at-corporate-double-tax-brady-tax-staffer-gets-high-marks-yes-the-irs-deleted-another-key-hard-drive-212275. Kaustuv Basu and Dylan Moroses, “Hatch Corporate Integration Draft Could Be Ready in a Few Months,” Tax Notes, January 29, 2016, http://www.taxnotes.com/tax-notes-today/corporate-taxation/hatch-corporate-integration-draft-could-be-ready-few-months/2016/01/29/18189631. For a detailed history of corporate integration proposals since the 1970s, see “Comprehensive Tax Reform for 2015 and Beyond,” Senate Finance Committee, http://online.wsj.com/public/resources/documents/Taxes121514.pdf. Here, and throughout, “corporate” and “corporation” refer to C corporations, unless otherwise specified. Over the past few decades, lawmakers have taken some steps to equalize the tax treatment of equity-financed corporate income and other business income. Most significantly, the Jobs and Growth Tax Relief Reconciliation Act of 2003 cut the top federal tax rate on qualified dividends to 15 percent, which significantly reduced the double tax on corporations. However, Congress has never fully eliminated the U.S. tax code’s bias against equity-financed corporate income. Furthermore, in 2013, the top tax rate on dividends rose to 23.8 percent, exacerbating the unfavorable tax treatment of corporate income. As detailed in “Comprehensive Tax Reform for 2015 and Beyond,” the Treasury Department has issued corporate integration proposals in 1975, January 1977, September 1977, 1984, 1985, and 1992. The White House has issued reports recommending corporate integration in 1985, 2003, 2005, and 2010. Congressional legislators have introduced major corporation integration bills in 1978, 2003. It may be useful to spell out this logic more explicitly. Under standard economic theory, a business will continue to pursue additional investments as long as the rate of return on these investments exceeds the interest rate. The business’s marginal investment will have an expected rate of return that is the same as the interest rate. This means that a business expects to make as much profit on its marginal investment as it pays in interest. In other words, a business expects that its marginal debt-financed investment does not lead to any additional corporate tax burden, because its interest deduction will be as large as its profits. Thus, under standard economic theory, a corporation’s marginal debt-financed investment is made in the expectation that no entity-level tax will be applied to the profits. Joel Slemrod, “Optimal Taxation and Optimal Tax Systems,” The Journal of Economic Perspectives 4 (1990): 157-178. Louis Kaplow, “On the Undesirability of Commodity Taxation Even When Income Taxation Is Not Optimal,” Journal of Public Economics 90 (2004): 1235-1250. Steven A. Bank, “Corporate Managers, Agency Costs, and the Rise of Double Taxation,” FSU College of Law, Public Law Research Paper No. 45 (2002). Victor Fuchs et. al., “Why do Economists Disagree About Policy? The Roles of Beliefs About Parameters and Values,” National Bureau of Economic Research, Working Paper 6151 (1997). 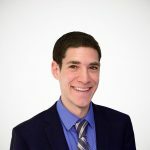 An excellent explanation of some of the considerations in the corporate debt-equity tradeoff can be found in Daniel Shaviro, Decoding the U.S. Corporate Tax, The Urban Institute Press, 2009. Alan Kraus and Robert Litzenberger, “A State-Preference Model of Optimal Financial Leverage,” The Journal of Finance 28 (1973): 911-922. Milton Harris and Artur Raviv, “Capital Structure and the Informational Role of Debt,” The Journal of Finance 45 (1990): 321-349. For an overview of this literature, see Milton Harris and Artur Raviv, “The Theory of Capital Structure,” The Journal of Finance 46 (1991): 297-355. However, there would still be a timing difference in the tax treatment of dividends and interest. Under the current tax code, interest is deducted as it accrues. Meanwhile, a simple dividends paid deduction would allow corporations to deduct dividends according to the cash method. One solution to this conundrum is simply to tax non-profit organizations on all of their investment income. While highly appealing from a policy perspective, this strategy is probably politically unfeasible. Importantly, a credit imputation system can create vastly different revenue and economic effects depending on how households are required to gross-up their dividends received.